One of the things I enjoy seeing the most is a well-functioning Math Center in a classroom. There is a constant buzz of constructive background noise, like a well-functioning machine, and everyone seems to be focused and content. Students are engaged and motivated to complete individualized work at their level and pace. Some are working on their own, while others are working together and learning from each other. Oftentimes, there is an element of choice. So, students feel a sense of ownership over their learning. Teachers are able to work in small groups and individually with students to give them the extra support or challenge work they need. In most elementary classrooms, Math Centers are a staple, yet developing efficient and effective Math Centers can require a tremendous amount of planning. Teachers must identify or create the personalized work and activities for each student while also planning additional mini-lessons for small-group or individual instruction. In my role as an Instructional Technology Specialist, I am always looking for ways to support teachers as they plan for Math Centers. Using TenMarks Math has made a tremendous difference for the teachers at my school. The trick is creating systems to incorporate TenMarks Math in a variety of ways so that teachers maximize the use of this tool and so that students are able to practice a variety of skills. Here are six ways to use TenMarks Math during Centers. In this Math Center, teachers assign individual assignments based on personalized recommendations or class assignments, and students work to complete these on their own. It is a good practice for students to have a white board and markers so they can work through the problem and show their work. An additional spin on this Math Center is to require that students record lessons learned from their mistakes and the immediate feedback in a journal or notebook. This allows them to reflect on their learning as it is happening. For younger grades, I always encourage teachers to provide manipulatives so that students can use their hands as they work through the problems. In this Math Center, students work in pairs to complete an assignment. I have seen this method work well when students share a device or laptop. They work independently on the problem and then take turns explaining the strategy they used to find their answer. This exercise allows students to see different strategies used to find the answer and encourages mathematical discourse between students. If they disagree on their answer, they will need to rework the problem together. It is also important to model for them the right way to discuss their work. It is a good idea to provide students with sentence starts so that they understand the right way to talk to each other. These include, “I agree with you because…,” “In addition to what you said…,” and “I disagree with you because….” Finally, you may also need to establish behavior norms and expectations for the appropriate noise level when students work together. This will take time, but it is worth it. This exercise is a little different because they are actually working together on a problem and helping each other work through it. It is important to consider the groups when you set up these Math Centers -- students should be in groups that are on their same level so that they are able to support each other. This is another way to encourage students to learn from their peers and explain their thinking. For small-group instruction, I encourage teachers to use the TenMarks Math automatic recommendation for ideas for differentiation. This way, teachers already have suggested activities for mini-lessons to support the needs of all students. It is important to remember that teachers should not just use this time to support students that are struggling. This is also an important time to challenge advanced students. The TenMarks Math lessons already contain suggestions for extension activities so it makes it easy to challenge students who have already achieved mastery. TenMarks Math Jam Sessions allow students to develop fluency in skills. I encourage teachers to make Jam Sessions into a fun competition, which can be leveraged during Math Centers. Students set a timer or work to complete a certain number of questions. Then, they record the number of correct answers they got on a chart. Students can decide which skills they want to work on, allowing them to take ownership of their own learning. Teachers can also decide that students work on particular jam sessions if it is something that is particularly relevant at that time. By adding another layer of competition, students are further engaged and focused during Math Center time. I encourage teachers to schedule one day for students to redeem points they earn completing work throughout the week. Teachers can use this time to incentivize students to complete a certain amount of work or achieve a certain average score during Math Center time throughout the week. 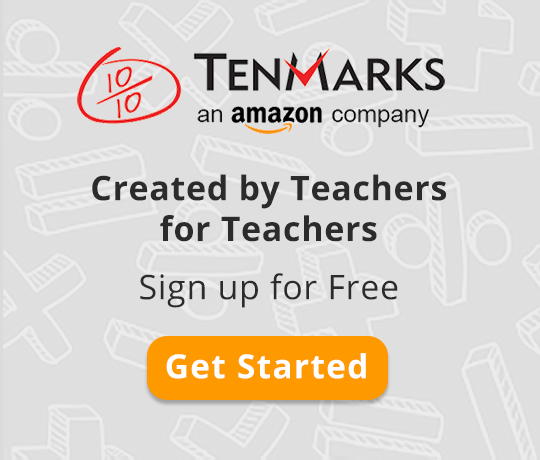 When completing work on TenMarks Math, students earn points that are redeemed for time to play games in TenMarket, which makes setting up this system really easy. I hope these tips help you save time planning while ensuring that students get the individualized practice they need to master math! Do you have other ideas for how to use TenMarks Math during Centers? Tell us your thoughts in the Comments section. Geri Pattie is an Instructional Technology Specialist at Tallwood Elementary School in Virginia Beach, Virginia. She teaches students in grades K -5 and coaches colleagues in instructional strategies with an emphasis in technology. She also serves as an Amazon Education Fellow, helping to bring best practices for using TenMarks Math to her school and district.